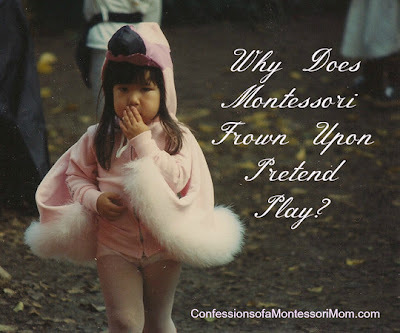 Why Does Montessori Frown Upon Pretend Play? I read that Montessori frowns upon pretend play, why is that? My daughter LOVES pretend play, and I see nothing wrong with that. I think all children do, am I wrong? No, you are not wrong! From my experience (of being in a classroom) the conflict lies in the pretend play materials themselves: there is no beginning, middle, or end. It is up to the child to start and end the activity (the activity is open-ended); or it is up to the adult to say when the activity starts and stops. Throw other children into the mix and it can get chaotic. I do agree that this is one of the biggest differences between Montessori and traditional preschool. As for Maria Montessori and why she frowned upon it, it was her belief that children base their pretend play (fantasy play) on the actions of adults and older siblings: pretending to cook, pretending to sweep, pretending to build a tower... She wanted to give them the actual experience! Why pretend to cook when you can actually prepare food that is real and not plastic. Why pretend to sweep when you can use a real child-sized broom. Why pretend to build a tower when you can actually make one with cubes (the Pink Tower). But when you allow children to prepare food, sweep, build, you have to have child-size materials that are age-appropriate. I eventually had to take my son (who has Down syndrome) out of Montessori (at age 4 1/2). He always had a strong desire for experiential play and the constant need to push the boundaries: "What happens when I put the sponge on the cat? What if I put all the crayons in the sink and turn the water on?" He also wanted to use everything around him as a prop: he loved to sing and dance and perform... so I had to improvise with activities at home! But to make a long story short, he could count, put numbers in sequence, say the names and the sounds of letters and he knew them in sign language, and he liked to write letters in chalk on the patio. And at age six he brought home his first book to read. I'm always fascinated in how the further I get from Montessori with my own child, the closer I get to Montessori! So how do you handle it if the kids want to use materials in a different way than intended? I have been letting my son do this as long as he still completes the work. For example, he pretends the knobbed cylinders are trains, he pretends the story of Cinderella while doing cleaning works, and he wants to draw and/or act out stories with the letters of the movable alphabet when we have him compose words with the alphabet and the write them on the chalkboard. After over twenty plus years of teaching I have learned to trust the child. And some children (very few it seems) have tremendous imaginations, so tremendous that no one and nothing should get in their way! If you have a child like this allow it and enjoy it! There is not enough "pure imagination" in our children in this high-tech, fast-paced society we live in! As long as the child is not throwing materials, or damaging them, it is OK! It is also a great way to see what interests your child! If it is trains, you can make train activities or drama works! I love it! You may also be interested in my Montessori and homeschool programs for birth to nine-year-olds at Montessori for the Earth.